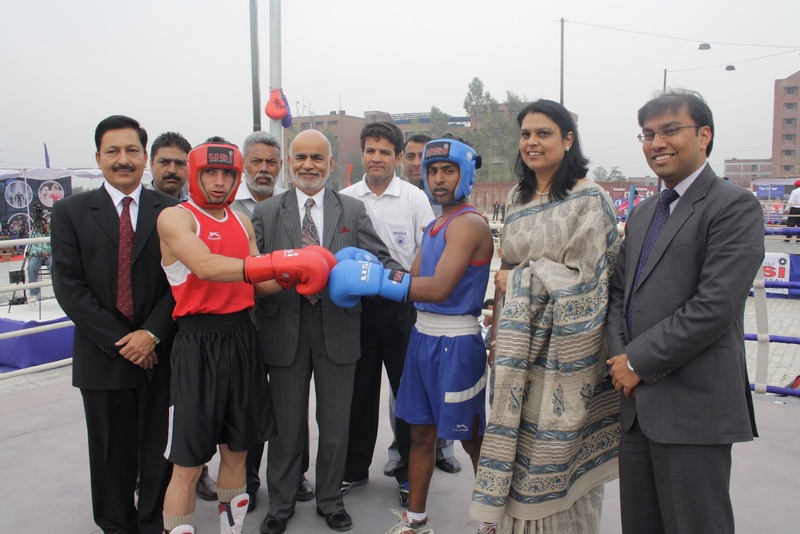 *Witnessed Quarter Finals of All India Inter University Boxing Championship at the campus, as the Chief Guest of the Day. Jalandhar: British politician and Member of the House of Lords, Honourable Lord Diljit Singh Rana MBE paid a special visit to Lovely Professional University. Paying back to his motherland, he has an aim to transform rural India by developing infrastructure and means for quality education. He was accorded a hearty & befitting welcome at LPU with floral presentations and mementoes, to cherish memories. The Chairman of Lovely Group, Mr. Ramesh Mittal, Vice-Chairman Mr. Naresh Mittal, Chancellor of LPU Mr. Ashok Mittal, Pro Chancellor Ms. Rashmi Mittal, Vice Chancellor Dr. Rameshwar Kanwar, and Director General Er. HR Singla were specially present on this occasion. It was also a great day for the Boxers from 70 Universities from across India as Honourable Lord Rana specially visited at the ongoing All India Inter University Boxing championship arena to cheer the fighters up for their glorious win. He also had interactions with the students and staff members during his visit to different blocks of hostels, faculty, laboratories and administration. Seeing the Infrastructure and technology usage at the university and on interacting with the students, Honourable Lord Rana felt immensely happy on pulsing the fast changes in education scenario: "The total international standards which are being provided to the students in Punjab needs special approvals and commendations. Prior to here all such developments could only be envisaged in the southern belt of India. I am very happy that such great educational Institutions have altered the situation and made Punjab feel proud of having the largest University of India on its sacred land for the benefit of many thousands of Indian as well as foreign students." Born in Sangol in Punjab, Rana is developing a cluster of 26 villages around his native place on the pattern of PURA (Providing Urban Amenities to Rural Areas), a concept conceived by former President APJ Abdul Kalam. Today, he is a successful property developer, hotelier and president of the Northern Ireland Chamber of Commerce and Industry. He is also director of Andras House and a leading figure of the Indian community in Northern Ireland. He is India's honorary consul in Belfast, in addition to his being president of the Global Organization of People of Indian Origin (GOPIO). good called Tutuapp VIP. This application works just like Tutuapp. https://tutuappz.com/ as well as Tablet PCs. TuTu app android additionally has nice. good tool easily and also for complimentary of cost. Well, to https://aptoideapkdownload.co/aptoide-ios-for-iphone-ipad/ name to the application to maintain working on a PC nice. I'm really happy that the british politician still visits home, it is very important to stick to your roots. He is a very wise and healthy man, mostly because he maintains a fit body. I do believe he trains on stationary fitness equipment for 6 days a week! Comply with the procedure step by step as well as log right into the chat app. Snapchat Online video clips and connect with your fans also videos will be gone after a while.